I was fortunate to meet George once. We were introduced by Robbie Meyer of L’Angevin while I was out in Napa working harvest this past October. We arrived to George’s house unannounced, and after walking through the vineyard, George was gracious enough to chat with us. He talked about how the California wine industry had changed, how excited he was about all the new interest in balanced wines, and even the blogosphere. Unsurprisingly, we also talked about Ribolla Gialla — and George made a fantastic joke about some of his clients picking too early. 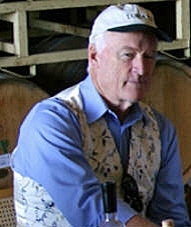 George entered the wine industry in 1972 while an executive with Schlitz Brewing Company. That year, the company purchased Geyser Peak Winery and appointed Vare as president. Over the next few years, he grew Geyser Peak into a 700,000 case winery before resigning to launch a number of other wine brands. George is likely best known for Luna Vineyards, which he founded in 1995 with wine industry veteran Mike Moone. Our thoughts go out to all George’s friends and family. He’ll be missed. George was not just a fine and generous wine person, he was an extraordinary human. His optimism and determination in the face of a devastating battle with melanoma was inspirational. He kept his humor to the end and his love for life and wine. The world has lost a marvelous person who, in the words of my wife, was a gentle giant. God rest his soul.